Painters Pants or Overalls - Wear what the pro's wear. So, you are ready to paint your walls. You have chosen the perfect color and you cannot wait to begin. Before you rush to open the paint can and start painting the walls, take a moment to prepare yourself. It is not enough to simply throw clothes on and hope for the best. 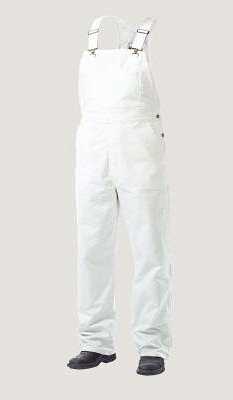 What you wear while painting can make all the difference in your safety during the task. Unless you enjoy getting paint in your hair, you will want to consider wearing a bandanna or ball cap on your head. In fact, it is better to wear an old one that is lying around the house than purchasing a new one. Not only will a bandanna keep your hair being covered with flecks of latex paint, it will also keep your hair out of your way. There is nothing worse than getting a foreign substance in your eyes. Painting is a perfect opportunity for flecks of paint, dirt and debris to become lodged in your eye. Do not give them the chance. Instead, wear safety goggles while you are painting. The look may not be very stylish, but it is better to have your eyes free of paint than wind up in the emergency room. The shirt and pants that you choose to wear should be comfortable, non-restrictive, and ideal candidates for getting stained with paint. A shirt that is too loose may brush against a painted wall or wind up with a sleeve in the paint tray. At the same time, a shirt that is too tight and restrictive will make it difficult to maneuver. Your choice of pants should have the same considerations as your shirt choice. Be prepared that your odds of getting paint on your clothes is extremely likely, so always select clothes that are old and destined for the rag pile soon anyway. Some homeowners may think that painting without shoes on is a better choice than risking paint on a new pair of sneakers. However, shoes are needed to stay safe. When you are climbing a ladder, shoes will help give you traction and support. Wear comfortable, old shoes that can get dirty without worry. If you are concerned about tracking paint through the house or getting flecks of paint on your new sneakers, cover each foot with a plastic grocery bag. You may look a bit odd, but you will ensure that your sneakers stay paint free should an accident or drip occur. You may also want to consider wearing an apron and latex gloves while painting. This will help protect your hands from paint splatters and your clothes from getting too dirty. If you are working with oil paints, gloves are a must because it is very difficult to remove oil paint from skin without toxic chemicals. What you wear while painting is important, so take the time to prepare before you rush into the task.